New York Painting Services is completely licensed and insured to supply the commercial businesses and residential home throughout New York and New Jersey with our professional contracting services. Our specialists have advanced training, valuable years of experience, and natural skills that are amplified with the use of professional grade products, tools, supplies, and equipment exclusively available to licensed professionals that assure our customers are receiving nothing less than premium results. Since 2004 we have upheld high moral standards and work ethics, applied friendly customer service, and executed each project to New York Painting Services maximum potential and we will continue to do so. The homes in New York and New Jersey are a place of refuge and security; a palace so to speak. Since your home is where you spend a greater portion of your time, it should reflect your personality, style, and sense of comfort. After years of the same old design, despite how perfect it may be, can start to make you feel bored. Dining rooms specifically are often the last place to get makeover. But where many families gather together for good food, projects, and visiting; making over the dining room could be exactly what you need. For those without a massive budget and cannot afford to completely gut your dining room, investing in a dining room enhancement might be your solution. Selecting one or multiple services from our menu can be just what the doctor ordered. 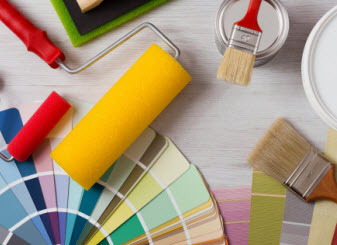 New York Painting Services dining room services include interior painting, wallpaper installation and/or removal, wainscoting, crown molding, baseboard, chair rails, drywall repair, popcorn ceiling removal, and more. New York Painting Services interior painting is an excellent place to start when enhancing your dining room in your New York/New Jersey home. There are several selections when opting to paint your dining room including faux painting techniques and texturing. 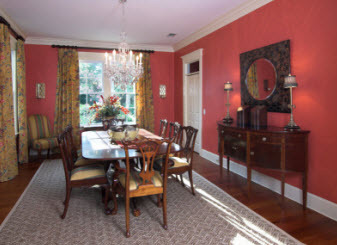 You can also choose to paint the dining room based on trends, psychology, or simply what you are drawn to. It can turn the drab dining room into an exciting place to hang. Trending now is bold colors coupled with neutrals, for example going a burnt orange to give the dining room warmth and keeping the floor pale can bring the room together. 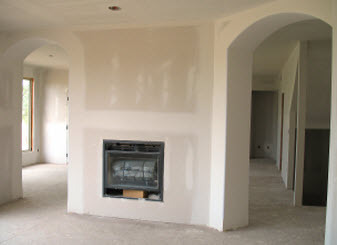 New York Painting Services offers drywall repair or replacements for when fun activities turn into accidental damage. Whether chairs have dented the walls over time or someone thought they could rock back and had fallen into the wall and created drywall damage, our experts can repair the damage or replace it if the area is excessive. New York Painting Services wall covering service; wallpaper, wainscoting, and more can bring elegance to your dining room. Whether you desire to remove old wallpaper and install new wallpaper or simply repaint the area, or add the rustic charm of wainscoting, the dining room can be transformed. New York Painting Services baseboards and crown molding service can be the finishing touches that complete your New York/New Jersey dining room. Crown molding, blending the ceiling in with the wall, and baseboards doing the same on the floor to the wall is a room’s accessory to bring everything together. There are a number of services New York Painting Services can provide in your New York/New Jersey home’s dining room to enhance the room and make it more fitting to your desires without breaking the bank. Choose a selection or just one service to completely alter the aesthetics of your dining room. Call us today to get started!